High-tech systems for tracking the movements of immigrants and other foreigners when leaving the United States would be installed at major U.S. airports under a plan approved by a congressional panel on Monday. The Senate Judiciary Committee voted 13-5 for an amendment to a wide-ranging immigration bill that would require the installation of devices to check immigrants' fingerprints at the 10 busiest U.S. airports within two years of enactment of the legislation. Checks currently are made at airports for foreigners arriving and re-entering the country but not when they leave. "It's just a matter of having records we can keep so we know where we're going," Republican Senator Orrin Hatch of Utah told reporters of his successful amendment. Advocates argued that the extra layer of screening also would help identify foreigners suspected of committing crimes or who are on terror-watch lists. But opponents questioned whether the move would improve the ferreting out of foreigners who have overstayed their visas and expressed concerns that it could open the door to broader fingerprinting of travelers. 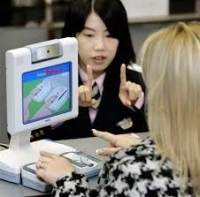 If the "biometrics" systems at major airports work out, they would be expanded to more airports across the United States and eventually be used at land and sea ports as well, under the amendment. During a work session that extended into the night, the Judiciary Committee defeated several Republican attempts to narrow the bill, including limiting some immigrants' access to federal programs, such as food aid and healthcare for the poor. The panel, however, added protections for young children of parents being deported from the United States and approved additional screenings for those coming from countries or regions seen as presenting a security threat to U.S.
After four long work sessions, the Democrats and Republicans on the committee have mostly been workmanlike, avoiding the contentious arguments that marked the last attempts, during the Bush administration, to revamp immigration law. Angela Kelley, an immigration expert with the liberal Center for American Progress, said that while the attempt in 2007 "was a real nail-biter, this feels more like a respectful exchange." With a growing Hispanic population in the United States demanding immigration changes, Republicans have become more open to enacting a bill this year, although it still faces many hurdles in Congress. The Senate panel is trying to wrap up work by mid-week on a nearly 900-page immigration bill that aims to ratchet up security along the southwestern U.S. border with Mexico and establish a path to citizenship for 11 million illegal immigrants already in the United States. The bipartisan bill also would create a new visa system so that farmers, high-tech firms and other American companies could get better access to both low- and high-skilled foreign workers. If the measure is passed by the committee this week, it could be ready for debate in the full Senate next month - a debate that could take several weeks to complete on the first major overhaul of U.S. immigration law in 27 years. The United States has been trying for years to tighten the monitoring of entries and exits by visa holders. An estimated 40 percent of the nation's 11 million illegal immigrants have overstayed their visas, according to government estimates. But the implementation of equipment at ports has lagged. Last week, the Senate Judiciary panel defeated an amendment from Republican Jeff Sessions that would have required the installation of biometric equipment at all U.S. ports before any of the undocumented could be eligible for permanent residency, or a green card. Sessions of Alabama, an outspoken opponent of the immigration bill moving through the Democratic-controlled Senate, argued on Monday that the United States has the ability to fully implement the program now. Saying that many local police departments already use the technology in their cars, Sessions said, "I'm getting ... tired" of the delays. Meanwhile, senators were working behind the scenes on a controversial move to reduce the steps high-tech companies would have to take before hiring foreign workers. Hatch has emerged as one of the most influential lawmakers working on the immigration bill and has introduced amendments to make it easier for companies to hire foreigners. In an attempt to secure his vote, Democratic Senator Charles Schumer of New York is trying to broker a deal between technology companies and the AFL-CIO labor organization on the high-skilled H-1B work visa program. During a break in the committee's work, Hatch told reporters that he must have changes to the high-skilled worker visa program, otherwise "you're just pushing these businesses off- shore." Lobbyists for technology companies and trade associations said the two senators were nearing a deal. But sources close to the AFL-CIO disputed industry's characterization. Even if Hatch gets what he wants on the H-1B program, he said there are other amendments he would insist upon during the Senate floor debate. Without those amendments, which he refused to elaborate on, "I will vote against it (the entire immigration bill) on the floor," Hatch said. One amendment is thought to require that undocumented residents who win legal status must provide their own health insurance and not take advantage of government-backed programs.